Tanda Tula is the first lodge in the Timbavati to offer a remarkable once-in-a-lifetime experience: the overnight walking safari. Tanda Tula Safari Camp is one of the most established and sought-after luxury wildlife safari destinations in Southern Africa – and now it is proud to be the first in the Timbavati to offer a remarkable once-in-a-lifetime experience: the overnight walking safari. Our walking safari expeditions are led by one of the most highly qualified ranger/tracker teams in South Africa, ranger Dale Jackson and veteran Jack Ngomane. Guests kick-start the day with an early morning, outdoor shower, steaming hot coffee and homemade rusks, before venturing out on a game walk. After a day spent exploring the great outdoors, guests return to the secluded Machaton Hide, a camp located high up on a platform on the banks of the Machaton River and overlooking a popular watering hole. Here they’re treated to a hearty dinner cooked over a fire in the traditional “bush kitchen” style. The Hide is rustic yet fully equipped with all the necessary creature comforts of camp beds, linen, mosquito nets , oil lanterns, bush showers and a loo. Memories are made and stories are shared around the campfire before guests retire with nothing but a mosquito net between them, the wilderness and the big night sky. The group walks for between ten and twelve kilometers per day, tracking wildlife and bird watching and stopping to take in the magnificent scenery and biodiversity of the reserve. An intimate group of a maximum of six people per walking safari can be accommodated, making the experience ideal for families, friends and couples travelling together. 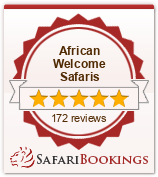 Contact one safari professionals to tailor make your Walking Safari at Tanda Tula. Please note: due to our rainy season, the Overnight Walking Safari experience is only available from 01 May to 30 September each year.